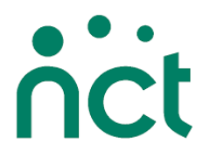 The NCT is a charity for parents that provides information and support through pregnancy, birth and the early days of parenthood. Becoming a parent can be a life enhancing experience but can also sometimes be challenging and stressful. The NCT aims to help parents at this time by offering relevant information, reassurance and mutual support. Helpline available Monday to Friday - 9.00am to 7.00pm (closes at 6.00pm on Tuesday). Breastfeeding line available every day from 8.00am to midnight.